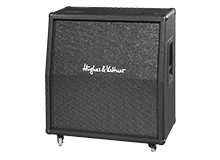 I first came across the name Hughes & Kettner in the early eighties while on tour in Germany. I heard a guitarist with the most awesome sound using the Cream Machine; at that point, I knew exactly what piece of gear I was going to buy. I am proud to be an official endorser of Hughes & Kettner, and in particular the TriAmp MK II. As the lead guitarist of one of Europe’s busiest touring bands, I need something that offers me reliability, and the versatility to create lots of sounds. I love the tone of the TriAmp, the punch and clarity that I get from it – even at low volumes… Quite simply, I have been content with my sound for many years. I’d be lying if I said I’ve never tried any other amps; but whether I’m in the studio or playing a festival stage, there’s something reassuring about those blue lights that sit behind me. I congratulate Hughes & Kettner for their 30 years in business, and thank you for the support you have shown me. You have made some great products and the GrandMeister 36 shows just how committed you are to providing us with yet more awe-inspiring products.